A very significant figure is again reached in next week’s draw (30th May) when the Jackpot reaches €8,000 as nobody matched this week’s numbers. Gary Prunty wins the €25 Lucky DIp prize. The Junior hurlers played Kilcoole, in their fourth league game on Wed 21st in Páirc Emmet Bhré. The early tempo was fast and furious. Kilcoole had come meaning business. Luke O’Reilly was quickest off the mark, followed by clever reading of the game from defenders Paul Barry and Billy Brazil. Robbie Mason’s opportunist goal also helped settle home-team nerves. However, the second-half offered little reassurance. This game was going in favour of the hungrier and more cohesive unit – Kilcoole. Bill Moorehouse’s introduction provided much needed scores, but it was Tom Cash’s accuracy and awareness that guided Bray to a share of the spoils. Barry Cowan and Enda McHugh also made significant contributions. Ar an líne, bhí ról tábhachtach á dhéanamh ag Pat Lee. Foireann : Conor McNally, Billy Brazil, Enda McHugh, Paul Barry, Michael Walsh, Peter Walsh (0-1), Cathal Reddin, Ryan Tynan, Barry Cowan, Sean Maloney, Enda Ó Maolmhuaidh, Danny Eglington, Luke O’Reilly (Captaen, 0-1), Jordan Lee, David Ebbs, Colin Salmon, Bill Moorehouse (0-1), John Ward, Tom Cash (1-7), William Robinson, Robbie Mason (1-0), Alan Sweeney, Cathal Ó Dúlacháin, Brian Lambe, Owen Brazil, Ishmael Mnensa, Daniel Kennedy. Bainisteoir – John Ward. 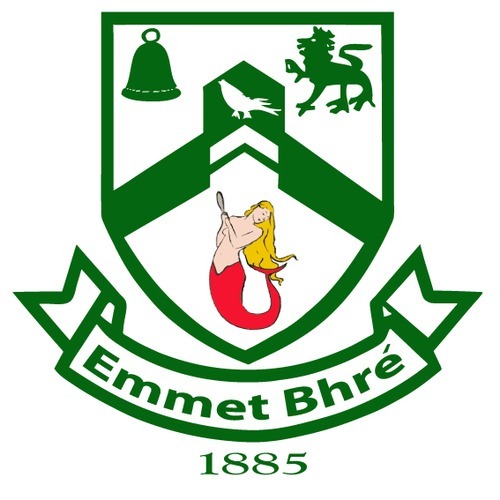 Bray Emmet Minors played out a draw in an enjoyable and exciting encounter with St Oliver Plunkett(Dublin) at a damp Emmet Park on Thursday last .The Bray team, fielding 10 of last year’s Minor finalist panel, dominated the possession stats in the first half, but failed to transfer this to the scoreboard with in particular some poor decision making in front of goals . Nothing between the sides at half time. On the restart, Plunketts enjoyed a ten minute purple patch, building a six point lead. But the Bray lads dug deep, shook off the early season cobwebs and finished the much stronger, with some excellent score-taking from man of the match Cathal McGee. A fair result on full time whistle with honors shared, reflecting the endeavor of both teams. Team: Andrew Sutton, Sean O’Connor, Shane Lohan, Patrick Cunningham, Finn O’Duill, Donnacha O’Midheach, Ciaran Browne, Padraig Doyle, Ishmael Mnensa, Conor O’Doherty, Eoin McCormack, Conor Byrne, Bill Moorehouse, Cathal McGee, Cian Rowe. In a rain swept Kilcoole Bray under 12 hurlers played their third hurling league game. Bray started well with Jack, Sam and Cathal doing well in midfield getting good ball into a dangerous forward line of Fionn, Philip, Rory, Oscar who took their scores well. Kilcoole settled more into the game but the back line of Aaron, Eoin, Tadhg and Zack kept the Kilcoole attacks at bay resulting in Luan having a quiet game in goal. Trying to keep players warm and moving was very important on the night and with a strong bench, Riain, Conor, Tim and Brian when introduced kept up the pressure on Kilccole with Aodain, Daniel, Ben and Nathan also making valuable contributions in the first half. In the second half, Kilcoole rose their game considerably scoring a number of excellent points and a well worked goal. The back line of Aaron, Riain, Luan (now playing outfield), Tadhg and Daniel continued to play well. Sam in goal was kept busy and ensured long accurate puck outs found their men, with Jack, Zack, Cathal, Fionn and Tim starting many dangerous attacks which Brian, Rory, Oscar and Nathan capitalised on. Eoin, Ben and Conor played really well in the second half with Aodain, Philip also making valuable contributions. This was a satisfactory performance with everyone though wet got plenty of game time, thanks to the Kilcoole mentors for hosting the game and Ciaran Gaskin for reffing the game on what was a very wet but typical “summers evening” in Ireland. Despite having a game the night before the Under 12 Dublin league team played Fingallians in their rearranged game out in Swords. Played in dry weather (for a change) against a very big and physical side, Bray took a few minutes to settle missing a few chances. The midfield line of Sam, Philip and Jack were beginning to get on top in this area getting good ball into the forward line of Fionn, Rory, Daniel and Brian who scored a well worked goal. In a very hard hitting contest Fingallians came back into the game soring a pointed free but the back line of Aaron, Zack,Tadhg, Ben and Sebastain (just back from injury) ensured Cathal had a quiet first half in goal. A couple of points before half time had Bray up by 4 points at half time. The second half saw some positional changes with Cathal coming out of goal and Brian taking over the number 1 spot. Bray got a great start to the half with two quick goals one well worked one a bit lucky to put Bray in the drivers seat. Great play from Sam, Jack Philip kept the pressure on the Fingallians back line where the forward line of Daniel, Rory, Fionn and “young Jack” were causing all sort of problems. The side line cutting of Cathal would put Joe Canning to shame with one effort leading to a goal. The backline came under more pressure as the game more on but Aaron, Ben,Tadhg, Zack and Sebastain take a bow you were great with some of the tackling a sight to behold!!! This was a great defensive performance with the back line in particular really excelling with Fingallians only scoring one point from play in the whole game. Special thanks to the parents who brought out kids to the game and thanks to Fingallians and the ref (appointed at a very late stage) allowing the game to run. Team: Cathal, Brian, Sam, Jack, Philip, Daniel, Rory, Fionn, Jack K, Aaron, Ben, Tadhg, Zack, Sebastain. The U12 Camogie team played against Commercials, Sat 24 May. The Rathcoole girls were a particularly strong and skilled side. Despite facing an ascent of the Matterhorn, Bray Emmets knuckled down and courageously undertook their challenge. Neasa Ryder and Úna Smierciak impressed with their defence, while Sarah Lambe and Laura McGarry combined well on a number of occasions. Sinéad Quigley also did very well when she moved into midfield, with tenacious support coming from Pearl O’Connor and Elena Ó Ceidigh. A final high point which merits inclusion was an exceptional high catch from the capable Emma Doyle. Míle buíochas do na tuismitheoirí a tháinig amach linn. Foireann : Amy Butler, Amy Healy, Caoimhe Purcell, Elena Ó Ceidigh, Emma Doyle, Laura McGarry, Neasa Ryder, Pearl O’Connor, Rachel Messitt, Róisín Benville, Róisín Murphy, Saoirse Canavan, Sarah Lambe, Sinéad Quigley, Úna Smierciak. Bainisteoirí ar an lá – Brian Lambe agus Larry Smierciak. Well done to the U16 Camogie girls who recorded a good win on Wednesday over Knockanna.There will be a break from games until after the Junior Cert but training will continue.Best of Luck to Kellie and Anna in the exams. Congratulations to Bray Emmets U14 Camogie player, Katie Baguley. Recently, Katie was selected for the Irish Youth swimming squad competing at the Canadian Nationals. This is a huge achievement to represent her country in Canada . Go n-éirí leat ann agus comhghairdeas mór leat. Please note that the following Fundraisers are in place and your Support & Help will be required and greatly appreciated. 14th June – Table Quiz in the Club House at 8pm. GREAT SUPPORT IS REQUIRED AND YOUR HELP AT THE ABOVE EVENTS WILL BE GREATLY APPRECIATED……. The Lenovo GAA Skills Hub is a nationally co-ordinated Gaelic Games programme of skill development activities taking place in a positive playing environment, providing boys and girls aged 13 -15 with the opportunity to derive maximum enjoyment from their involvement in Gaelic Games. Winners of a draw among all participants at each Skills Hub Venue will receive a LENOVO Ideapad!